Ok folks this is so easy, there is no excuse to make one every weekend. It's rich, it’s creamy and oh, so good. 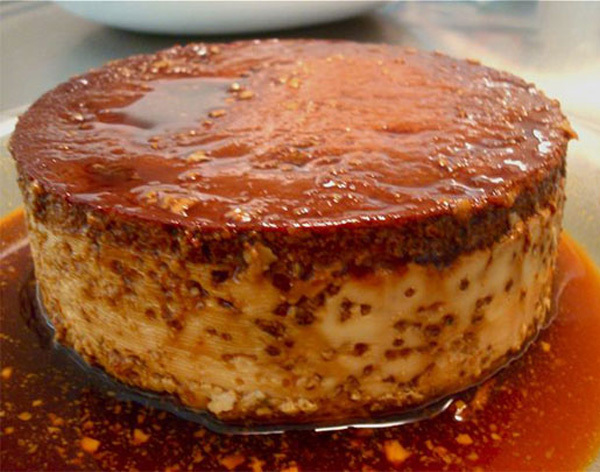 In Venezuela, as well as most of Latin America, everyone makes Flan and most of you probably have tasted some type of version of this creamy custard dessert. In Venezuela we make our version of Flan and call it: "Quesillo". The ingredients are your basic eggs, milk, vanilla, caramel and sweeten condense milk and a dash of run. It is bake either in a pressure cooker, or in the oven using the bain-marie (also known as a water bath) technique. Or the most original way will be in a cracker/cookie can, which I will talk about later. The desert gets its name because, "Queso" mean "cheese" in Spanish and when its bake right and un-molded, it comes out looking like a "cheese". And while it’s super simple to make, oddly enough, most of the Venezuelan makes it only during a special celebration. Every birthday party has a cake and a Quesillo. 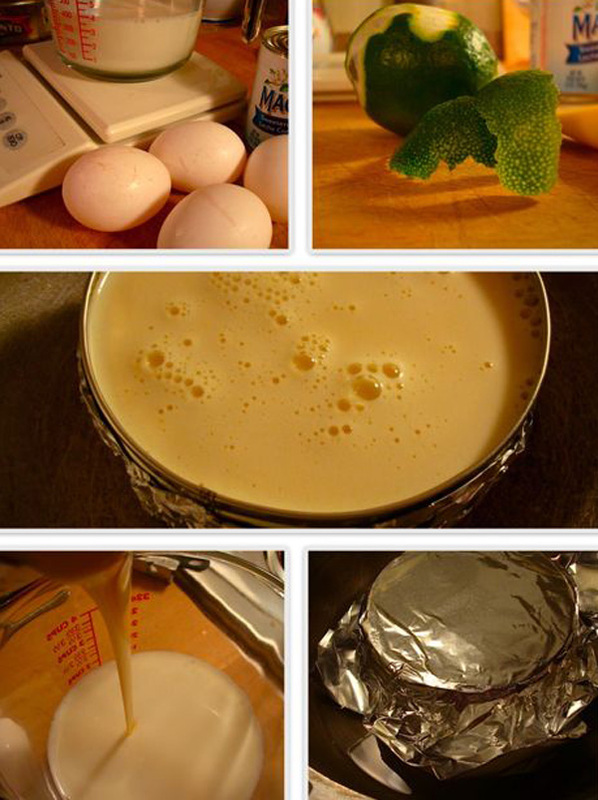 The cast of ingredients is composed of eggs, sweeten condense milk, whole milk, vanilla, lime peel and rum. But first we need to make the yummy caramel sauce - all it takes is sugar and a bit of water. In a heavy sauce pan and mix the sugar and water, over high heat. The sugar will start to boil and then will start to slowly turn colors on you, first into a pale amber, and escalating into a medium, dark color; NOTE: Once you hit the pale stage DON'T WALK AWAY FROM IT, because it will jump into the medium and then dark very, very fast and if there is nothing more horrible, is BURNED sugar! So, make sure you are on top of it at all times. When you see it turn into a dark rich color, remove from heat and pour into the baking dish. Tilt back and forth to cover the bottom and sides of dish, getting it nice and evenly coated. Again, be careful, the caramel at this stage is very hot and may burn you (Badly!). I usually cover my baking dish with a towel while I'm coating it. Let the caramel in the pot cool, so put it aside. Side note: Let’s talk about the baking dish for a bit. You can use any you like. But, my grandmother taught me to use a cracker or cookie can as seen below. Don't let the look fool you, this is the best thing to make the Quesillo in. Yep, you read it right, a can! Which it’s the perfect baking vessel, it has a lid, which fits nice and tight and its the right height and it may sound totally off the wall, but the can gets cured with past baking and the caramel and custard just taste better. But, you can use anything you like if you can not find, or feel comfortable using a can. Back to making the actual custard. The next step are simple enough, in a blender, pour the can of condensed milk - YUM! (lick those finger - go ahead you are allowed, I can wait) Then take the empty can and measure the whole milk and pour into a separate glass container (I use a measuring cup) with the strip of lemon peel and put in the microwave for about 2 minutes to warm up. Back to the blender I go and pour the warm milk, then the vanilla and run (if you are using, which I highly recommend you do) the blender at medium speed for about 1-2 minutes, while you are running the blender, you start adding the eggs one by one until fully incorporated. Pour the custard mixture into the baking dish that you coated with caramel and place inside a larger pot. I usually like the specs of the lime peel, but if you don't you can strain the custard before it goes into the coated caramel baking dish. You are ready to bake it! Take your baking dish and cover the top with aluminum foil, nice and tight. Then place into a bigger heavy dish/pan. You are ready for the water bath - Pour in enough hot water into larger pot to reach halfway up the sides of the baking dish. TIP: if you squeeze the previous peeled lime into the water, the pot you are using will not turn black during the baking process. Slowly place into the middle rack of your hot oven and bake about 55 minutes, covered. Then uncovered and bake another 20 minutes. The custard is ready when you touch it and it feels firm but a bit wiggling in the middle. Take out of the oven - again, be very careful, since the water inside the large pot it's very hot! Set aside to cool off, about 30 minutes or so. Once is cooled, place in the fridge for at least 3-4 hours before serving. I recommend you leave it overnight. When ready to serve and un-mold, dip the flan in a saucepan of hot water, or in the sink full of hot water from the tap for a few seconds. It should lose up, but sometimes, you need to run a knife around the edge to help it a bit. Invert the Quesillo onto a plate with lip in order to save all that yummy caramel!